Poor Silas. He didn't sleep well last night. He would wake up coughing and was poorly all day. He spent most of the day on the couch with a runny nose and a nasty cough. It progressively got worse and after speaking to a triage nurse decided to take him to the ER. We went to Mendy's Place Pediatric ER. They were so wonderful and got us in and out in under an house. 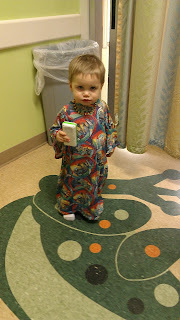 They gave him an oral steroid and told us to use a humidifier, elevate him while sleeping, and give him Motrin and Tylenol for fever throughout the day. If symptoms worsen then we'll take him back in. 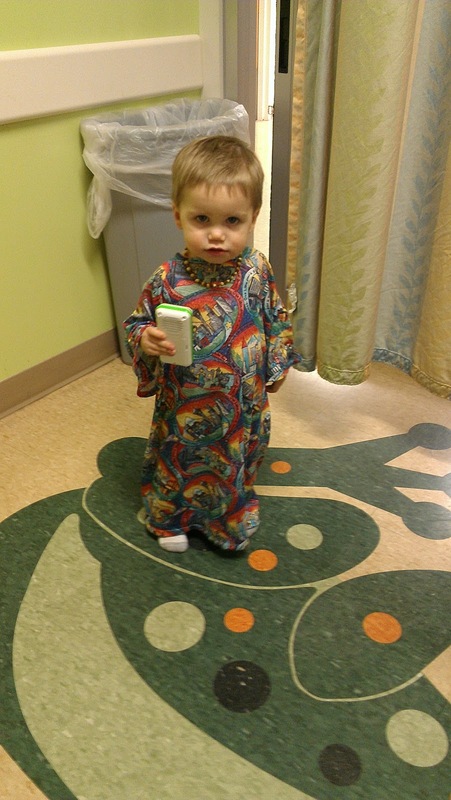 Even though he was sick, he looked super cute in the hospital gown. He was shuffling around like an old man and kept trying to get people to answer his phone calls. Thankfully, after the steroids, he started feeling much better. Unfortunately he is contagious so we won't be going to any of the play dates we had planned this week.